The BBC has gained exclusive access to one of the most secretive buildings in the UK - GCHQ, the government listening station. But, says Mark Savage, it wasn't exactly a warm welcome. "Don't take it personally," said the woman behind the reception desk. But it was hard not to. People were avoiding us and there were signs all over the building warning of our presence . "Caution. BBC Radio 4 recording here. 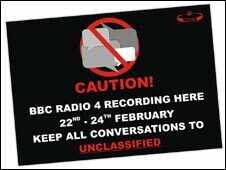 Keep all conversations to 'Unclassified'." It was hardly surprising. 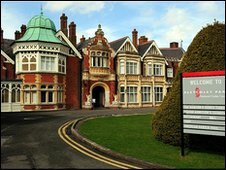 We were being allowed to record inside one of Britain's most secret establishments - GCHQ, the Government Communications Headquarters in Cheltenham, Gloucestershire. Their job is to listen in on others, record their conversations and pick up their e-mails. It is said, by the government, to provide "essential intelligence in the battle against terrorism and [contribute] to the prevention of serious crime". But for the first time in its history we were turning the microphones on them. We didn't exactly walk right in. Negotiations for access to this highly secretive operation lasted several weeks. Could we, they enquired, assure them that the microphones we were going to use were as "low sensitivity as possible"? And would we, they asked, allow their sound engineers to listen back to the recordings we made in open areas to check that we hadn't picked up any conversations that we shouldn't have? And then, when we got there, there was layer upon layer of security checks. We got past the first two before my recording equipment was taken away to be examined. I left it with three men in a room who were standing round a table with all sorts of weird looking devices. "Please look after my baby," I said, before being escorted outside. (Producers can, understandably, be very protective about their recording machines). I have no idea what went on in that room but it obviously included the electronic equivalent of a full body search. I had to piece everything back together afterwards. Even the batteries were treated with suspicion - if I needed any more over the next 48 hours, I was told, they would supply them. There were more checks to come. We hadn't, at this stage, even got past main reception. A rather forbidding looking receptionist asked for identification before pointing to a sign which expressly forbade anyone taking cameras, mobile phones and - rather bizarrely, given the reason we were there - recording equipment or similar electronic devices into the main building. Somehow we got through and there we were, strolling with our minders, round what is known at GCHQ as The Street, a circular walkway which runs throughout the building nicknamed affectionately, The Doughnut. Visitors to Cheltenham have to wear a red badge to mark them out, but you couldn't miss me. I was the one wearing headphones and carrying a large microphone. People gave us a wide berth. It felt like I had a communicable disease. As one of the UK's three intelligence agencies - the others being MI5 and MI6 - secrecy at GCHQ is ingrained. But some of those we spoke to were forthcoming if not about the substance of their work, then about the personal effect. One member from the counter terrorism section described what it is like to listen in on terrorists' conversations and the constant battle to predict where the next attack will come from. "I don't think you would be human if you didn't go home at night and couldn't switch off and thought 'Oh my God. What happens if...'"
Yet there were others who weren't entirely happy about the BBC's presence. As if to hammer the point home, there was an announcement over the public address system within minutes of our appearance. "Blinds facing the street between blocks A and B should be lowered and closed immediately. End of message." It turned out that a member of staff was worried about us being able to see through the windows into the open plan offices facing onto the street. They didn't want us to be able to read what was on their computer screens and had alerted security. There was a low whirring, grumbling noise and the shutters came down. There were reminders of past "transgressors" - people who had betrayed their secrets - all around us. Dotted around the building were glass cases with exhibits from GCHQ's history including two radio sets. 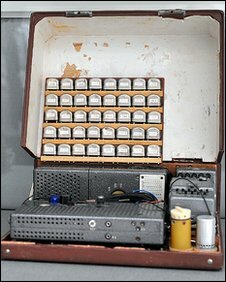 The first was a radio used by the Portland Spy Ring to send messages back to Russia in the 50s and 60s. Next to it was a radio set which had been discovered by a farmer ploughing his field near Aberystwyth. It had been cached there by someone working for the Soviets but, to this day, no-one has any idea who it was. Still, there was an upside to being avoided if not altogether shunned. We had no trouble getting a table in the staff restaurant when it came to lunchtime. You had only to announce that we were from the BBC and diners would obligingly move away to make room for us. It's not something you could count on when booking a table at a high class restaurant like Quaglinos but then GCHQ is an altogether different world.